Whisper it quietly, but Great Britain could just win the Davis Cup this year. Belgium have accounted for holders Switzerland, and Argentina for Serbia. The strongest all-round team in the competition were France, until GB finished them off on a memorable weekend at the Queen's Club. Andy Murray is the only top-10 player who can feature in the semi-finals. "With the position we're in just now, we'd love to do it," said Murray, as he looked forward to a third successive home tie against a fellow Grand Slam nation. Britain will play Australia in the middle of September, with the winners to face either Belgium or Argentina in the final at the end of November. James Ward took the vital scalp of John Isner in the first-round tie with the US in March and Jamie Murray looked every inch a Wimbledon finalist when he partnered his brother in the doubles at Queen's. They still have a big contribution to make, but know the biggest weight will be carried by Andy Murray. The expectations, and the assumptions often made about the outcome of his matches, would suffocate many. If bad weather at a Grand Slam forced someone to play a five-set match three days in a row, his chances of winning the title would be immediately downgraded. Yet that is what Murray achieved over the weekend: his brother may have shared the load in the doubles, but that encounter was sandwiched between matches against the 11th and 12th best players in the world. Until the last few points of the second set, it looked as if Sunday's match against Gilles Simon might prove a bridge too far. Tired of body and mind at the end of a frenetic spell of tennis, Murray was being outplayed by a Frenchman only too happy to construct gruelling rallies, which more often than not turned out in his favour. And yet Murray still won the match - ultimately with plenty to spare - and left his captain in no doubt he could play another three matches in the semi-final if it was in the best interests of the team. "I think Andy is one of the fittest athletes on the tour, perhaps even in world sport," Leon Smith told BBC Sport. "He got through it, against the highest level of opposition. Obviously it's very tiring, but he got through it." Australia boast two top-50 players in Bernard Tomic and Nick Kyrgios. Both can be spectacular, but that is never guaranteed. Sam Groth's serve, Thanasi Kokkinakis's raw talent and Lleyton Hewitt's vast experience make all of those players potentially more dangerous than their rankings suggest, but Smith knows a place in the final is within his team's capabilities. "It's a tough ask, but we've shown that we've beaten probably the strongest team in France," he said. "Because we've got Andy in our team, and a world-class doubles player in Jamie, and James Ward - who will have a really high-level summer tournament schedule because of where his ranking is at now - then we will be difficult to beat." Can a good cup run inspire the next generation? It would be nice to think that a run to the final would inspire people to flood to their local tennis courts, and that as a result we will one day produce a greater volume of top-100 players. The two years that have elapsed since Murray's Wimbledon victory suggest this is most probably wishful thinking, but this is another excellent opportunity for the Lawn Tennis Association. Instead of having just a few weeks in June and July, the governing body now has a third attractive home tie of the year to showcase the sport. Tennis feels like a year-round sport in the UK in 2015, with the chance that coverage could extend until the last week in November. A final between Britain and Argentina would also be staged in the UK. How do you find the right venue in less than nine weeks? But where will these ties take place? It would be possible to play a mid-September semi-final outdoors, but a roof would be preferable, and the All England Club has suggested it would be impractical for the tie to be staged at Wimbledon. And so an indoor hard court seems most likely, and perhaps more logical, in the aftermath of the US hard-court season. Finding a suitable and available venue may be the tricky part. Any indoor venue must be ready for team practice from the Monday before the tie. Time is also required to build the court and its infrastructure, which means a 10-day window needs to be found. Florence and the Machine have already secured Glasgow's SSE Hydro; Michael McIntyre has booked Birmingham's National Indoor Arena and the Dalai Lama is on the bill at London's O2 Arena. I'm not aware that the Dalai Lama is a tennis fan, but there may be flexibility in the schedules of some suitable venues around the UK. 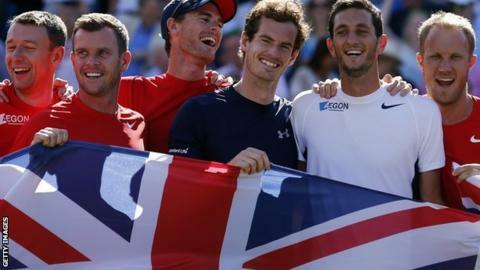 And after the success of the tie against the US at the Emirates Arena, and this weekend's clash at the Queen's Club, there may also be a few owners who think they would like to be associated with what could turn out to be a memorable year for British tennis.